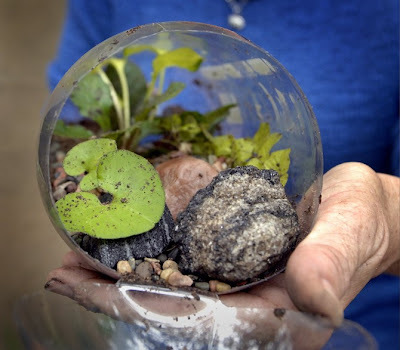 Here's a new how-to guide on making terrariums at the Michigan live website. The how-to focuses on creating sustainable ecosystems within terrariums to foster long-term plant growth. The article suggests using clay pellets as a purification filter for the system instead of charcoal as the pellets are supposed to last 3 years or more and charcoal can "wear out." I have never heard of these clay pellets- has anyone else had any experience with them? Many terrarium tutorials suggest adding a layer of charcoal to keep odors at bay, but local experts say the charcoal only works for a couple of years. If you plan to maintain your terrarium for longer, substitute a layer of fired clay pellets. These are commonly used in place of dirt in hydroculture systems. How interesting, well worth considering. I would wonder the same thing myself. I would like to make a sustainable terrarium with no Sphagnum (peat moss) and no charcoal. I live in the pottery capital of North Carolina, we have a lot of red clay here, so fired clay pellets seems like something that I could get locally. Have you guys learned any more about this? I imagine clay pellets would make a fine base layer for a terrarium but I am not sure if they would be as effective at filtration as aquarium charcoal. Let us know how it goes!